How does the Pro Starter subscription plan work? With the Pro Starter plan, you get 50 new downloads every month. These downloads are accumulated for the next month if they have not been used, up to a maximum roll-over of 300 downloads. For example, if you use only 30/50 downloads in May, you will have 80 downloads to use in June. 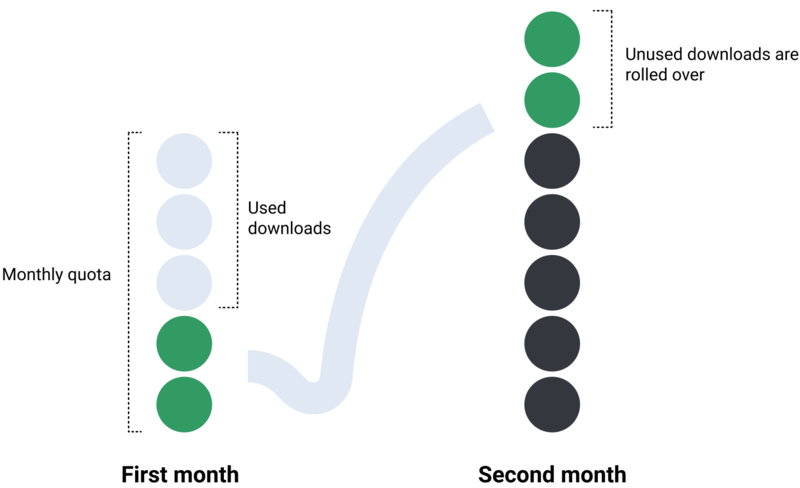 Read more about Roll-over downloads. If you reach the download limit for the month and wish to continue downloading more icons in the current month, then you can upgrade to the Pro Unlimited plan anytime. This will give you additional downloads. Here you will find more information about How to change your Pro subscription. The subscription plan is an auto-renewing plan. This means that you will be automatically charged every billing period (either every month or year depending on the billing option you have chosen). To stop your subscription, you need to cancel it before the next billing period. Read about How to cancel your subscription. A subscription plan can be cancelled anytime. It can also be reopened after the cancellation. If you only need it for 1 month, do not forget to cancel it before the next billing period is due. You can read about it in this article: How to subscribe to Pro for only 1 month. ❗Note: If you cancel, you can still use your remaining downloads until the day the subscription expires (the last day of the period you have paid for). After that, the unused downloads will expire too.